With the launch of its Spring/Summer 2011 collection, Turk + Taylor has nowhere to go but up. And we do mean that literally. The San Francisco label has always been partial to materials with a backstory (vintage army blankets, recycled sails, deadstock fabrics), but designers Mark Lee Morris and Andrew Wayne Soernsen developed a hankering for something bigger: a retired hot-air balloon from Colorado that they gently unfurled before cutting it into manageable pieces. The ripstop nylon was "destined," according to Morris, for a second life as a series of one-of-a-kind, color-blocked windbreakers. Certainly there was no shortage of material. "I actually rough-calculated the quantity at around 400 yards of fabric," he tells Ecouterre. The rest of the collection practically designed itself, but then Turk + Taylor, which cranks out its mens and womenswear in the Bay Area, has never shied away from unconventional colors or patterns. “Our challenge is to create inspiration; to create garments that inspire people, draw attention, and never underestimate the power of fun,” Morris says. Turk + Taylor, which cranks out its mens and womenswear in the Bay Area, has never shied away from colors or patterns. Ecouterre readers can get 25 percent off all Turk + Taylor purchases through its online store with the code TURK25SPECIAL. Up, up, and away! On her: Cuba safari dress ($154), made from organic cotton/recycled polyester rainbow buffalo plaid. On him: Wight Western Shirt ($110), from the same material. 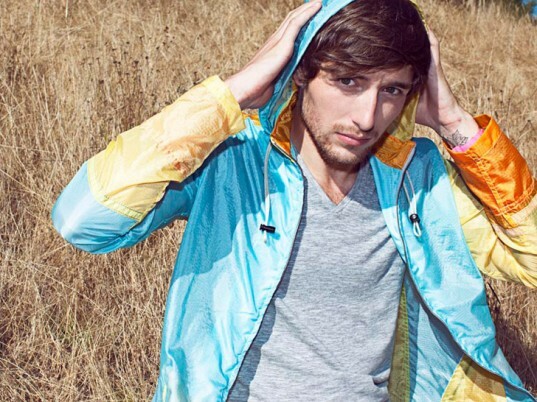 The Bioko windbreaker ($168), made from a recycled hot-air balloon. The Bohol pocket jacket, derived from vintage linen stripe. This rouge/cream style is available exclusively at MAC. The Mombasa cowl sleeveless dress in heather-gray organic cotton. The Bohol pocket jacket, made from organic cotton twill, paired with the vintage-cotton-canvas Vancouver short. On him: Bali hooded poncho ($136) in blue/black linen stripe. On her: Ibiza hooded coverup ($136) in the same material. Another look at the Bali hooded poncho. The Mombasa cowl sleeveless dress in black silk jersey. A closer look at the Ibiza hooded coverup. The Newfoundland Concept Y-Top in red/sand linen stripe, plus the Upolo Short in vintage zig-zag cotton canvas, available exclusively at MAC. The Upolo board short ($92) in a multicolored-plaid blend of organic cotton and nylon twill. The Manhattan sash dress in black silk/cotton twill. The Bohol pocket jacket, again.